• Our expert faculty and rigorous curriculum will train you to understand, interpret, and communicate big data, so you’ll be prepared for a career in marketing, marketing research, pricing, business analytics and analysis, or sales management. • The program is STEM-designated, which shows recruiters that you’ll arrive on the job with analytic tools and leadership skills that positively impact a company’s bottom line. In addition, the designation allows international students to work in the US for up to 36 months on a student visa, if hired in a STEM-eligible role. • Get hands-on learning experience by joining Simon Marketing Association, which hosts an annual inter-school Simon Marketing Case Competition. Joining Simon Pricing Club is another great opportunity, as the club undertakes a number of regularly scheduled initiatives in conjunction with the Center for Pricing, including attending the Professional Pricing Society conference and inviting pricing industry leaders to campus. Learn more about our MS in Marketing Analytics program details. There are currently 81 students in the MS in Marketing Analytics program that are, on average, 22-years old. About 73 percent of the class is comprised of female students, with 27 percent male students. The GMAT range (80th percentile) is between 630–730, and the GPA range (80th percentile) is between 3.1–3.8. Students in the program have an average of six months of previous work experience. 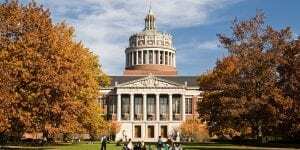 Tuition for the University of Rochester MS in Marketing Analytics is currently $66,000. More than 50 percent of MS in Marketing Analytics students receive scholarship support.